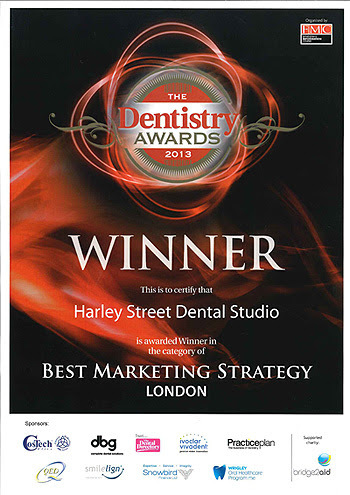 The award-winning Harley Street Dental Studio ended 2013 in spectacular style winning ‘Best Marketing Strategy’ (London) at the 2013 Dentistry Awards. In an ever-more competitive market place, Harley Street Dental Studio (www.harleystreetdentalstudio.com) took a strategic approach with a clear focus on differentiating their offer to increase patient satisfaction. Working in partnership with Max Jenvey and his purple team at Oxxygen Marketing, Harley Street Dental Studio delivered innovation to the market, but more importantly an exceptional customer experience at every level of the business. Principal Dr Mark Hughes emphasised the importance of a strategic approach: "We are delighted to receive this award. It reflects our commitment to both growing our business and reaching out to patients offering them the highest quality aesthetic and restorative dentistry". These factors alone do not ensure success; the real heroes of this award are the amazing team at the practice, from their outstanding Care Coordinators, hygienists, nursing teams and their renowned clinicians – delivering excellence to patients every time. So how exactly did Harley Street strike gold? Firstly, adopting a back-to-basics approach reaffirming the brand's vision, mission and corporate values which, in turn, drove the basis of a consistently compelling marketing campaign on all formats! A new website design injected a fresh, modern and contemporary feel which represented the clinic's core propositions and saw the birth of a number of specially-designed dental packages destined to engage the business community. This was followed by extensive market research which formed a targeted monthly online campaign e.g. SEO that engaged patients searching for relevant treatment terms and target words and phrases. The tactical deployment of a PPC campaign further caught the interest of key advertisers and promoters enjoying conversion rates of +35%. By adopting a web-based strategic marketing approach, Harley Street Dental Studio delivered a consistent, clean and professional online presence whilst retaining the brand's core values based on those who run the practice.